Depending on the specific application and project, your rivet needs may vary. Various types of rivets may be used based on how you need that rivet to function. Working with an experienced rivet manufacturer can help to ensure you have the right rivet for the job. When working with a rivet manufacturer, however, there are a few important tips to keep in mind. Doing so can help to eliminate any problems you might experience, including delays due to not having the right fastener. First, it is important to determine the types of rivets carried by the manufacturer. For many applications, a standard rivet will suffice. Rivet manufacturers typically carry numerous styles of rivets, including solid rivets, semi-tubular rivets, shoulder rivets, and countersunk rivets. In addition to those basic styles of rivets, the manufacturer may also be able to make various adjustments in order to meet your specific application requirements. Such alterations could include the type of material that is used, as well as finishing options. In other options, a stock rivet may not work for your specific application. When this is the case, it may be necessary to design a custom rivet. Prior to choosing a rivet manufacturer, it's a good idea to ensure that the manufacturer you select will be able to handle custom jobs. This is certainly not the case with all manufacturers. 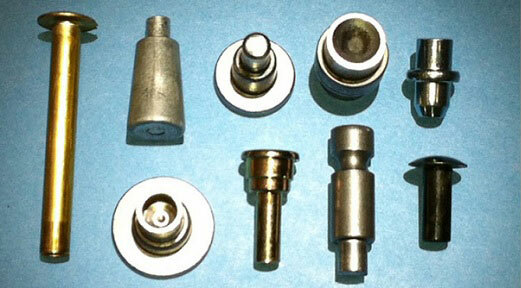 At Universal Rivet, we specialize in providing not only stock rivets, but also custom rivets. As a result, you can rest assured that the rivet you receive is designed to meet your exact specifications. As part of the process of designing a custom rivet with the manufacturer, it is important to be certain that you provide all of the relevant details regarding what you need. This includes how the rivet will be used and in what type of application. Information regarding diameter and length will also be required. If there are specifications regarding the type of material required, that information should also be provided. Depending on the specific type of application in which the rivet will be used, certain finishes and coatings may also be required. Providing the most information possible can help to ensure the best results when working with a rivet manufacturer.